When we’re not playing the Doctor Who Roleplaying Game, we are, of course, watching Doctor Who. Our most recent marathon was remarkably varied, a visual feast that featured screenings of everything from New Who webisodes to Torchwood installments to the bonkers Channel 5 telefilm Hotel! (2001), starring Paul McGann, Peter Capaldi, and Bradley Walsh. (That’s right. It has to be seen to be believed!) As is tradition, we also seized the opportunity to cook up a diverse selection of cocktails and hors d’oeuvres ranging from the simple to the elaborate, each of them celebrating our favorite series. These drinks and nibbles might be just the thing to serve up during your next RPG session, so, one-by-one, we’re sharing the recipes with you. Today’s recipe is certainly on the simple side. Indeed, it barely qualifies as a recipe! You don’t have to be a master chef to prepare a platter of Doctor Who cheese and crackers. All you need is patience, a sharp knife, and a bit of imagination. With a keen eye and a little trial and error, a slice of sharp cheddar can be transformed into a Type 40 TARDIS with a broken chameleon circuit! Your favorite hard cheese can shapeshift into an Adipose, a Silent, or an Ice Lord’s helmet. Add some pepperoni or other garnish for a bit of contrast and serve it up on your favorite cracker. Consider the possibilities for the game table! Once your players acquire a taste for edible Story Points, there’s no going back. 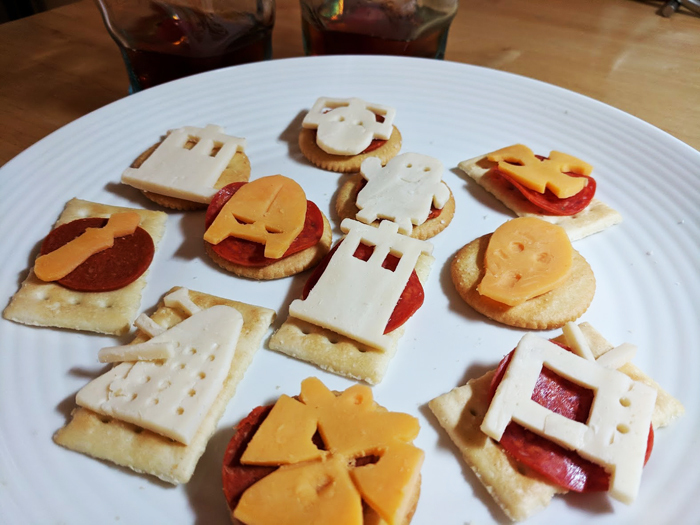 Our thanks to Better Homes & Gardens for inspiring us with a plate of Halloween hors d’oeuvres prepared using cookie cutters. Have a look at their slideshow for more spooky party food ideas.